Well, I’ve been back in England for 3 days now and so far it’s been lovely! It’s been raining and I think I have enjoyed it for the first time in my life. 40 degrees every day got a bit exhausting after a while! I spent my last 4 days in Benicassim for FIB and it was amazing! Very different to a British festival but at the same time so similar! I got to see some of my favourite artists so it was a fab way to finish my year! My year in Spain has probably been the best thing I have ever done. With it being difficult at times and nearly wanting to leave – I am SO glad I stuck it out and took this opportunity. Everyone around me was so supportive, which is just what everyone needs in this kind of experience. During my time in Madrid, we were given an ERASMUS Grant from Coventry University. This I used mainly to travel. I visited 6 new countries in 6 months which I was really pleased about as my aim was to visit 5. I even had the oppurtunity to visit 2 new continents – Africa and Central America. Travel was one of the main reasons for my year abroad as it is something I have been passionate about for years so I loved this aspect of my year abroad! I made SO many new friends who I can’t wait to be back in Coventry with! Not only this, but my relationships with other people have definitely got stronger too. I am a much more motivated, focussed and directed person now with more of a plan with where I am heading in life now and this is something that an independent year in Spain helped me figure out. I created a bucket list of 55 items. 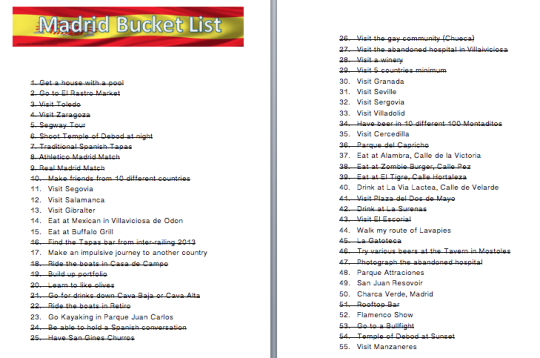 These being things to see, do, places to eat/drink etc whilst on my year abroad in Spain. I was so pleased that I managed to tick off about 66% of my bucket list! I am really looking forward to returning to Coventry. My year abroad has prepared me so much and I have some exciting ideas for the next couple of years which I can’t wait to share! Thankyou for following this blog while I go on and on about random stuff during my year. I will be updating it as regularly as possible whenever I do anything exciting!